Gene Davis has a new product that boosts the magnification of Leupold, Sightron, and Weaver BR scopes. A threaded ring with a Zeiss lens simply screws on to your scope behind the eyepiece, using the threads provided for lens caps. (Consider it an eyepiece extension). Both 2X and 3X models are available. The 2X version increases image size about 15% while the 3X boosts the viewed image roughly 30%. Hence, on a 36X scope, Davis’ 3X booster creates the equivalent of a 46X power scope. Starting with a 45X Leupold you can get 58X power. Many long-range BR shooters are using this product and reporting to Gene that they can see bullet holes at 600 yards and beyond for the first time. However, there is a price for the extra magnification–the reticle will appear slightly larger, and the image will appear somewhat darker. But, according to Gene: “the image darkening is almost imperceptible during prime daylight hours.” We think Gene’s invention is a winner–a great way to get more magnification at a low cost–$100.00. We also like the fact that, unlike an internal boosting job, you can simply remove the Booster if you want to return to the original magnification level. 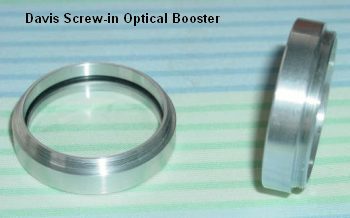 Gene reports: “If the scope has screw-in lens caps, these Optical Boosters perform well. We started with a product for the Leupold Competition scopes. We now have Optical Boosters for Weaver T36 and Sightron 36BR as well. We are working on other brands of scopes and the earlier Leupold scopes that do not have threads for the cap. The Optical Boosters do a fantastic job for old or poor eyes. They fit any Leupold scope that has screw-in lens caps, as well as the Weaver and Sightron 36-power target scopes. The Boosters require no internal modification and will not effect the factory warranty. The Optical Boosters (either 2X or 3X) cost $100 delivered.” To purchase, contact Gene Davis at (740) 503-4486 or gdavis10 [at] columbus.rr.com. Joe Pellegrene: “I just got back from the range using my new 3x magnifier on a 45x Leupold. Now it’s a 60x scope and I can’t imagine how I ever lived without it. If anyone’s having trouble seeing their bullet holes on the target this product is well worth the money. It’s easily the most significant piece of equipment that I bought yet. Share the post "Davis Power-Boosting Scope Lens Insert"
Neck-Turning: I found that a 1/2 inch Dewalt drill with a keyless chuck will hold many caliber cases without an adapter. Just place the case in the chuck and twist it hand tight. Does the same work as a $250 case lathe. When neck-turning cases, you can hold the drill in one hand and the neck-turning tool in the other. But it’s much more efficient if you clamp the 1/2″ drill in a vise (with some carpet for padding). Then it’s very easy to control the turning speed and add/remove cartridge brass. Powder Measures: If you’re throwing powder charges in the fall or winter and have problems with bridging or sticking powder, use a ground wire. This will help reduce static charge that causes clinging and clumping. I have a 25-foot piece of real small wire with alligator clips on each end. It’s that long so I can run it down the hall to a water pipe. Use the wire tie from a bread bag to hold it in a small roll to put in the range box. When using it at the range use a 6″ nail from the co-op or Lowe’s / Home Depot and just push it into the ground. Share the post "Reloading Tips: Neck-Turning and Powder Measures"